I’ve coached kids for years, so many years now that my first cross-country team is now grown up, starting their own families and looking for ways to get their own children involved in sport. As a young teacher, I did it all: cross-country, volleyball, basketball, and track. Now that I am more experienced and in a large school with other teachers who have their own set of expertise, I can focus on what I know best: running and track. 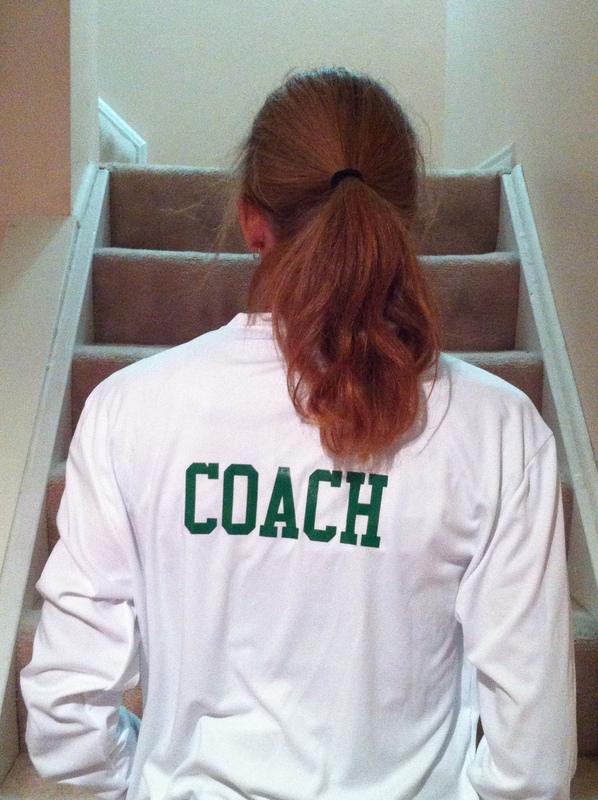 When my own children were young, I coached their soccer teams. It didn’t take long, though, for them to walk away from the sport. My oldest was a music guy; my youngest simply didn’t have the maturity or mindset to play a team sport. It didn’t make sense to force them to play so our family went on a soccer hiatus as they became more involved in other sports. This year, both are playing soccer again. The Littlest Dude, 10 years old, asked me to coach his team. My oldest shut down that idea. Whether as a teacher or a parent, I coach because I want to. I don’t keep track of how many hours I have put into selecting and organizing teams, corresponding with parents, running practices and competing; nor do I worry about the unexpected costs that can be incurred, such as buying relay batons for track or gloves for our soccer team’s goalie. The excitement that kids bring to each practice or game and the occasional thank you (yes, thank you’s are far and few between) make it worthwhile. I can’t imagine working with kids in a sport setting not being a part of my life. Sadly, that is now taking place in my work life. In Ontario, elementary teachers are currently in a Work to Rule situation. We have been without a contract since September 2014, and our union and the provincial government continue to negotiate. Among the issues the union is standing up against are increased class sizes and significantly reduced support in Special Education. In order to show concern to the government, teachers have gradually walked away from tasks which are not assigned parts of our jobs, but have come to be expected. This past Wednesday, all extra-curricular activities have been added to the list. The government’s response was a threat to reduce teachers’ pay. Like many other teachers I know, I already miss spending time in extra-curriculars, be it a team, an art club or an outreach group. Docking our pay, though, is not the solution. In fact, exactly how do you take money from someone for not coaching a team that they volunteer to run? How do you remove pay from a volunteer? As a parent, I completely understand the frustration that others have over the cessation of extra-curricular activities but it would be far more frustrating to see my 10 year old child in a class with over 30 students. How could I possibly expect any teacher, regardless of youth or experience, to be able to manage a class effectively, plan, teach, assess, and report accurately? Add in all other expectations, such as coaching and other many demands of the job, and our education system will certainly lose strong teachers; it will fall apart. What we need is not threatening language or complaints. Public support and respectful negotiations are a must. Understanding is essential. Once those are in place, things will settle and we can slowly re-establish the public education system in Ontario. Disclaimer: The views and opinions above are solely my own. They have not been endorsed by others. The boys and I have been pretty excited about the PanAm Games being in Toronto. Now, for those of you who aren’t in Toronto, the Games are really being held in Toronto, Milton, Mississauga, St. Catherine’s, Hamilton and a few more suburbs on the other side of Toronto. So, really, they aren’t just being held in Toronto and this makes getting to them a logistical nightmare; from where we are, getting to any of the venues takes some effort. But so does raising a child. How could I not give my boys the opportunity to see some of our national athletes compete on home soil? Tickets are reasonably priced and they include the cost of public transit. 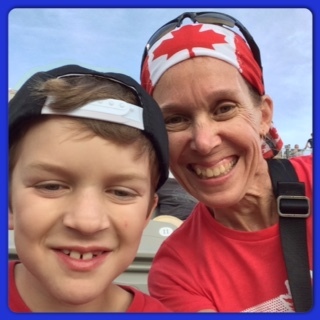 Soccer was the obvious choice as games are at the Tim Horton Stadium in Hamilton, which is close to home, one son plays soccer and the other referees the game. For me, it is important that my guys see Canada play. Yesterday, the three of us dressed in Canada’s colours and headed to the GO station to watch Brazil play Peru and, then, Canada face Panama. We got to the stadium in time to watch Brazil, Peru and their referees warm up. Son #1 had his eyes on the refs and was obviously taking mental notes on what he could be doing before he takes charge of the field. I pointed out to both boys that a lot of the drills are the same as the ones that we use when running and reminded them that a lot of world-class runners use to be soccer players. When I heard, “Look, he’s doing some accelerations!” I knew that running terminology was becoming more and more natural to the littlest dude. What I also liked was seeing a different drill – a combination of A’s and side-stepping – that I will use with the kids when I start coaching cross-country again. And it was. Even though it was an 8:30 start and only about 40% of the stadium was filled (a lot of people left after the first game), it was the place to be. We cheered, we did the wave (many times), we watched a beach ball being bumped around from section to section until a volunteer took it away, and we cheered some more. The littlest dude asked for his ipod, which we brought for the train ride home, so that he could take some pictures. There were no requests to go for a walk; there wasn’t any whining about being tired of sitting. Without a doubt, he was happy. And my teen? He was thrilled that he was able to watch, not one, but two games with national level athletes. 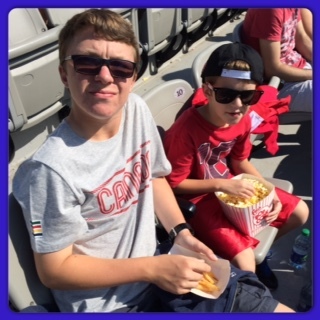 Both boys loved the chance to see our athletes play so close to home. We talked about how sad it was to see the stands so “grey” during the second game. “Yeah, Canadians need to watch our own team play, not just leave,” commented the littlest dude. And he is right. Seeing Brazil play Peru was great, but supporting Canada is really what it is all about. We did – and we’re going back for more. Go Canada!